Timeout for Baskets – Timeout for Art! (La Concordia Ecuador)- Several years ago while riding a bus from the cloud forest of Mindo to the Pacific coast, I spotted a simple tin-roofed home with a variety of baskets displayed out front. The sight intrigued me, and I watched with wistful eyes each time I zoomed past in transit. 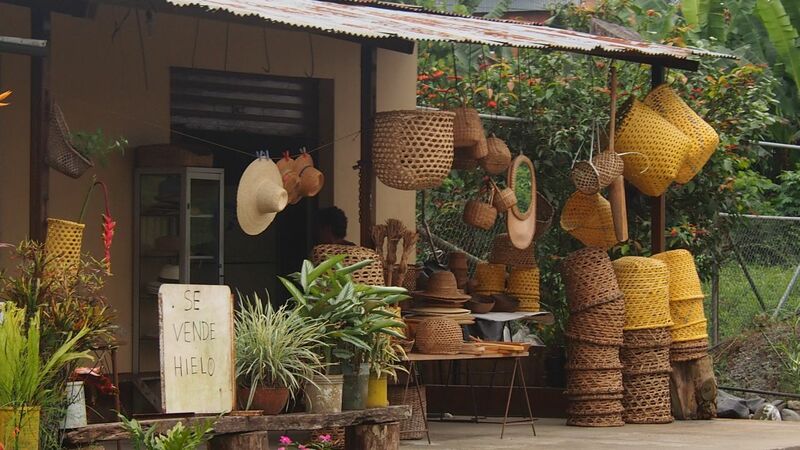 This past week as Barbara and I drove from Mindo to the coast, I watched for the “House of Baskets” as we reached the ‘rotunda’ at La Concordia. We parked just past the house and crossed a primitive footbridge that delivered us to the yard. Two smiling women immediately greeted us, and Barbara and I stepped into a beautiful cultural exchange. Never sure if I’d be targeted as a tourist willing to pay twice the normal price, I bashfully asked, “Quanto cuesta?” and pointed to one of the larger baskets to define a starting point.